Informant America: What If A Sinner Pays For His Sins, But There’s No Redemption? What If A Sinner Pays For His Sins, But There’s No Redemption? Richard J. Wershe, Jr., better known to some as White Boy Rick, is a sinner. There isn’t any argument about that. He is the first to admit it. When it comes to crime and punishment Wershe has paid for his sins, over and over for his entire adult life. Yet, no one shows him any mercy. Evil men who have done far worse, men who have killed people, men who have lured countless young people in to drug addiction have been convicted, sent to prison and are back on the streets while Wershe languishes in prison. As this blog has noted before, while Rick Wershe sold drugs wholesale for a brief time he never operated crack houses, he never had an organization of dealers, and he never got involved in drug violence. Yet he’s doing a life prison term. What’s more, very few of the supposed men of justice, the ones whose careers were advanced partly due to Rick Wershe’s life of sin and life as a secret informant, have done anything to help him. One retired narc who used Wershe extensively to make undercover drug buys when Rick was 14 and15 years old has turned his back on Wershe. This guy has a new life now. He’s reportedly a big man in his church. Yet people who know him say he won’t do a thing to help Wershe get a parole. He could help, but he won’t. Apparently he only consorts with the “saved” nowadays. Yes, Rick Wershe is a sinner. But he’s paid for his sins many times over AND he has helped the so-called law and order men put many dangerous criminals in prison. He’s disrupted at least two murder plots—from prison. He helped the FBI ensnare about a dozen corrupt cops—from prison. The ex-narc who has turned his back on the sinner who once helped him arrest drug dealers ought to ask himself a question many Christians like to ask themselves: What would Jesus do? Here’s a hint: He wouldn’t turn His back on someone in need. I can’t find anything in the gospels where Jesus turned His back on anyone who needed help. Then there’s the Detroit Assistant United States Attorney who promised Rick Wershe he would go “balls to the wall” to help him with his life prison sentence in the state system if Wershe would just help him nail a murder-for-hire gang by testifying before a federal grand jury. Wershe stepped up and did his part. The Assistant United States Attorney totally forgot his promise to Wershe. He’s done nothing to help him. We’re left to wonder if this Justice Dept. attorney's word is worth anything. Rick Wershe believes he knows the answer to that one. At least a dozen FBI agents or supervisors used Rick Wershe’s undercover informant work to make cases, which helped advance their careers. FBI special agent Herman Groman says he turned over to the DEA—Drug Enforcement Administration—information provided by Richard Wershe, Jr. which helped that agency prosecute the “Best Friends” murder-for-hire gang mentioned above. Wershe returned to Detroit from prison to testify before a federal grand jury for the DEA and the Detroit U.S. Attorney’s office. With Rick Wershe’s help, a 56-count grand jury indictment was returned and most of the Best Friends gang was sent to prison. Yet, when Wershe came up for parole in 2003, two DEA agents lined up against parole for him and testified AGAINST him. He remains in prison to this day. Why did the DEA turn on an informant who helped them make a big case? Why did the DEA help bury one of the FBI’s most productive informants of the 1980s and early 90s? The answer to that question remains a mystery to this day. Richard J. Wershe, Jr. started down this road in 1984 when a pair of FBI agents was talking with his father, Richard J. Wershe, Sr. about what he knew about various crimes. The senior Wershe, now deceased, was often on the edge of right and wrong. That same year, the elder Wershe was “opened up” as a formal confidential informant for the FBI. FBI agents sometimes met with the senior Wershe in the presence of the junior Wershe. It didn’t take long for the Detroit FBI to discover the younger Wershe knew plenty about the Curry Brothers, a politically-connected east side drug gang they had in their case sights. Johnny Curry was married to Cathy Volsan Curry, the attractive niece of Detroit’s then-mayor, the late Coleman Young. 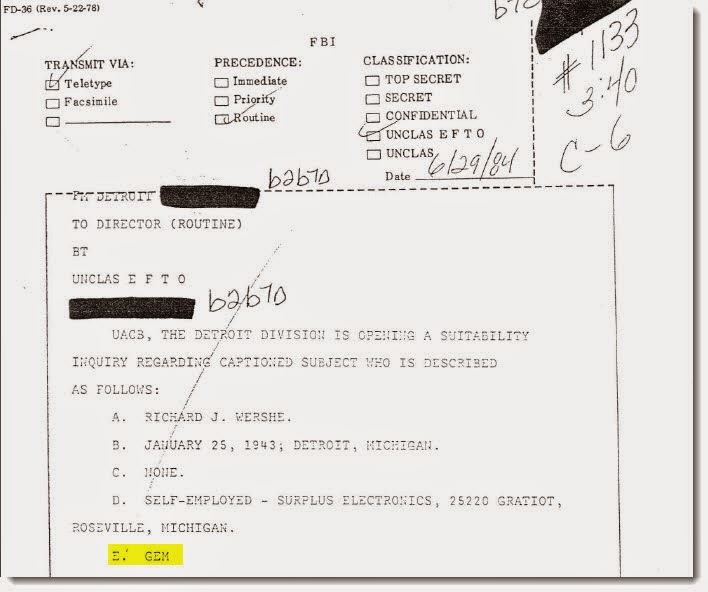 As was explained in a previous blog (White Boy Rick—A Child Of Coleman Young’s Detroit) Young had long been a target of the FBI dating back to his days as a leftist radical in the Red Scare McCarthy era. That made the criminal associates of Coleman Young’s relatives of high interest to the Bureau. But overall FBI agents are a smart bunch. They quickly realized that the Wershes—father and son—had the same name, with Senior and Junior as the distinguishing identifiers. What if they started using young Richard J. Wershe Jr. as an informant in the Curry Brothers investigation and filed the informant reports as information coming from simply “Richard Wershe?” What if they just happened to forget to note whether the information came from Senior, an adult, or Junior, a minor? Perfect. Sort of. We need to remember the FBI is the Federal Bureau of Investigation. So it has bureaucratic ways. FBI files are case-based. Case investigative reports are written on forms known as 302s. Informant information is placed in a case file as an insert. Then there are case memos which are periodic summaries and there are teletypes to headquarters in Washington, keeping the muckety mucks informed about progress on major cases. Some of the FBI file information about the informant work of Richard J. Wershe, Jr. has been released in the course of various Rick Wershe court matters and it is heavily redacted. That is, parts are blacked out for various reasons known as exemptions under the federal Freedom of Information Act. Federal agencies sometimes respond to Freedom of Information Act (FOIA) requests for files by turning over blank or blacked-out pages. This wasn’t Richard J. Wershe, Sr. It was the junior Wershe. The father didn’t know the young dopers. His son did. I recently asked White Boy Rick—Richard J. Wershe Jr.—how he signed for the informant payments he received from the FBI when he was confidentially snitching on the Curry Brothers drug gang. “Gem,” he replied. He didn’t know I had researched the answer. An alert reader might wonder how the number of guns cited in the insert jumped from 20 to 112. A purely speculative guess is that an extra “1” was mistakenly added and the writer meant to say 12, not 112. This is a minor incident but they add up. This FBI informant “insert” shows there are errors in federal law enforcement investigative reports which are never corrected, never challenged. And it shows the disdain federal agents—in this case from the ATF—have for people who risk their necks to help them make cases. It’s true that many informants are slimeballs, scumbags, and criminals manipulating the system to stay out of jail and keep committing crimes. But others do not fit that description. Yet, too many cops—federal, state and local—don’t seem to make a distinction between one informant and another. Far too many of them don’t seem to care what happens to their informants. They are there to be used and exploited to make cases and when they’re no longer useful, it’s on to the next case and a new snitch or two. But hey. There are so many cases and so many informants. Who has time to worry about what happens to them and what happens to so-called justice?